Harvest Festival or what is locally known as Pesta Kaamatan/Kokotuon for Penampang district was held on 19 May 2012 at Buhavan Square in Donggongon town. The auspicious celebration was officiated by Tan Sri Bernard Giluk Dompok, Malaysia's Minister of Plantation Industries and Commodities. Miss Samantha will represent Penampang at the peak of the state level Kaamatan celebration on 30-31 May 2012 at Hongkod KDCA, Sabah. There will be about 40 participants from all over Sabah at the final, should all districts send in their representatives. 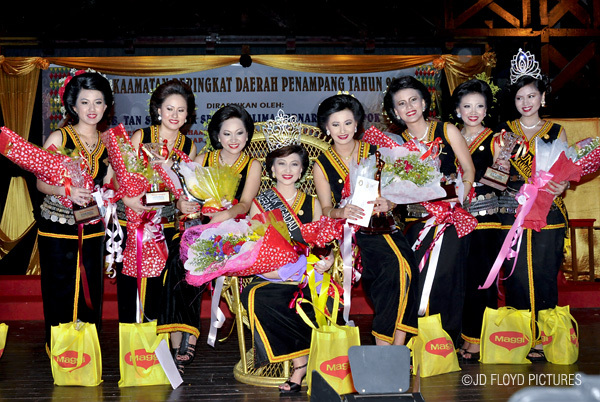 Miss Bo Tiza Disimon, the state level Unduk Ngadau 2011 and Penampang Unduk Ngadau 2011, made her final appearance at the Penampang District Kaamatan celebration. See you at Hongkod Koisaan (KDCA) on 30-31 May 2012! Unduk ngadau yg sangat menarik, ramai sumandak lawa ni haha..
wow beautiful sumandak wif beautiful capture. me proud to be sabahan wif da beautiful sumandak hehehe. Hi there everyone. See them in person on 31st May 2012 at KDCA Building, Penampang during the final day of the state level Harvest Festival celebration. An exciting extravaganza awaits you. Bias is subjective, it depends on which perspective you at looking at things. That's where the panel of jury comes in. But if people start questioning the credibility of the judges, they must also come with suggestion/s. Is cold water heavier than hot water? Canada can't achieve its greenhouse gas goals? Geothermal project put on hold? What is the world's smallest combustion engine?